The idea of staying home and reading my way through my TBR and knitting my way through my yarn mountain is really appealing right now, but sadly I do have to earn a living. 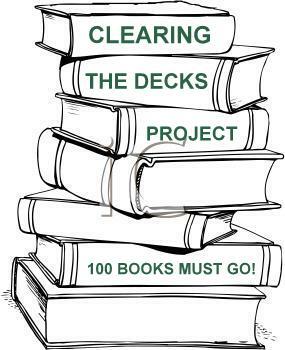 I’m going to be positive, and press on with my Clearing The Decks Project – 100 books have been lodged in my home library to be read or ditched and then leave the house – it’s very therapeutic! I cleared half a dozen in January, but then I had a little break to read Virago Modern Classics and now in February I’m losing myself in Victorian novels. Well I have to read the keepers too! But I’m still hitting the home library for things to read in between, and advice would be very welcome. This latest selection to be introduced has a fair few “why on earth did I but that” books, so I really don’t mind if it’s negative. Please tell me – which books did you like – or not like? Which would you like to know more about? I bought this in a secondhand bookshop with last year’s Orbis Terranum Reading Challenge, but then I read Tove Janssen for Finland instead. Maybe this year?! I read a magazine article, I was intrigued and so I picked up a copy of the book in question. Not my usual sort of thing, but sometimes, I think, you have to read something completely different and you have to look at life’s harsher realities. This one caught my eye in a charity shop when I noticed that it was a US edition – not something we see to often in Cornwall – and I do like culinary memoirs so it came home. but now I look more closely I’m really not sure. Already read, and written about here. An interesting book, but one I can let go. The project works! I can never resist books about books, but I can’t hold on to them all. I recognised Nancy Huston’s name when I saw this on the Orange Prize longlist a few years ago. I loved the mark of the Angel, and so I put fault Lines on my BookMooch wishlist. It took a while, but eventually a copy turned up. It was 50p and the library sale shelf, so what could I do?! A charity shop bargain. Anna Maxted writes a nice line in what I would call serious, grown-up chick lit. Does that make sense. The sort of book I would have devoured in my London commuting days but doesn’t call so loudly now I’m in Cornwall. Another charity shop bargain, and once again the sort of book I would have happily read on a London commute and am less sure about now I’m in Cornwall. And that’s the end of this batch – advice please! Cannot help with any of those books. Though be interested to see what others say. I haven’t read any of them but I’ve heard Sworn to Silence is good. All unknown to me but I am sure you will get lots of recommendations. I hope you succeed in reading through all of them. Just wanted to let you know one of your photos of Briar with a book was featured on the Virago Press blog today: http://www.viragobooks.net/all-things-virago/ — too cute! 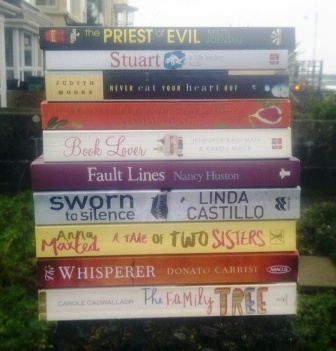 I’m afraid I’ve read none of these… but if you do get rid of Stuart: A Life Backwards, then I’ll swap you for something, as my book group are reading it later in the year!